Recently, I have noticed that the language flag for Uyghur language is , which seemed truly terrifying to me. This symbol was the proposed flag for 'East Turkestan', which was a terrorist proto-state that not a country on Earth had ever recognised. It is NOT the flag of Xinjiang Province where most of the Uyghur people lived, nor a globally recognisable flag for the nation/language. This would have the same implication from using the flag of ISIS for the Arabic language. Therefore, I strongly advice you to change the flag, and if possible, to flags like . It has more natural meanings and, more importantly, not biased. the font used is Thabit, which is free. @cueyayotl what do you think about this? Can we go ahead and merge it? I don't think you would find any Uyghurs agreeing the change of the current flag, but I accept that some Chinese people may find it a threat to their 'national unity'. While Muslims are the easiest target in the current zeitgeist, they might want to change the Tibetan flag used on Tatoeba, too, if possible. It's also banned in China according to Wikipedia. Btw, the Uyghur flag was adopted in 1933. Linking it with the ISIS flag is pure propaganda. Anyway, If the Uyghur flag is going to be changed, I suggest using 'UIG' (the ISO code for Uyghur) on a blue background. It's more universal and not all Uyghurs use the Arabic script. Also, if the Uyghur flag is replaced and the Kabyle (MAK) flag stays, that will be just one big double standard. I respectfully disagree. This flag was only adopted once by a proto-state, that no countries on earth have ever recognised it as a legitimate country. Therefore, I must conclude that it is a disregard of generality to use this flag for the entire group of people, esp. when they are hoping peace on their lands. Again, this blue flag is NOT a publicly recognised symbol of the nation/language, nor the flag of the Xinjiang Uyghur Autonomous Region. If as you said, it is Chinese people's intention to target muslim, then I think you completely misunderstood the situation. There are more than 20,000,000 people in China – not living in a single province, but over the entire country – who are Muslim; they are Chinese, and most of them are Chinese since a thousand years ago. How could Chinese people targeting themselves? I would assert that the saying 'Muslims are the easiest target in the current zeitgeist' is truly racist. Nobody else is making such discrimination but this opinion-holders. One could easily check from Policy paper: Proscribed terrorist groups or organisations, page 18. It states clearly that 'East Turkistan' is a Terrorist Organisation. This public policy paper is a public document by UK government, available on gov.uk. TIP has been banned by the UN and is also sanctioned by the USA under the Terrorist Exclusion list. I'm not an Uyghur and I won't personally prolong the discussion, but I sent e-mails to some Uyghur websites to inform them of the issue. I also sent PMs to some Tatoeba users who list Uyghur on their profiles. So, some Uyghurs may also join the discussion in the future (if they read my message and are interested). I hope this will also increase contributions in the Uyghur language as a positive side effect. That was the case with the Berber-Kabyle issue. Such debates tend to boost contributions. It's good to look on the bright side of things. @sabretou what do you think? On Tatoeba, we have used unofficial, cultural flag icons frequently on Tatoeba. Our goal with using a flag as an icon on Tatoeba should be to maximise potential users. Tatoeba is apolitical not in the interests of 'political fairness', but in the interests of its own expansion. It is not Tatoeba's objective to mediate political conflicts, but to promote language learning. In this particular case, I have not seen any credible evidence so far that the flag we are using on Tatoeba is directly linked to a terrorist organisation. However, I am still in favour of changing it. The reason I think it should be changed is that the flag is unacceptable in China, which is where the majority of Uighur speakers are based. As such, the use of this flag could discourage a number of Uighur users and learners from contributing to Tatoeba. I believe the best solution to this issue is to adopt a 'neutral' flag, i.e. to have the flag code on a white field, similar to Kashmiri. I am also in favour of applying the same solution to Tibetan. Normally, I wouldn't take part in this discussion any longer, but seeing no Uyghurs came (perhaps they didn't even read my email - they're probably dealing with thousands of spam mails every day), I want to add a few more words. The Uyghur flag used on Tatoeba is older than the current flag of PRC. Linking it with terrorism is untrue. Impersonator gave a good example for this faulty logic. It's banned in China (like the Tibetan flag). 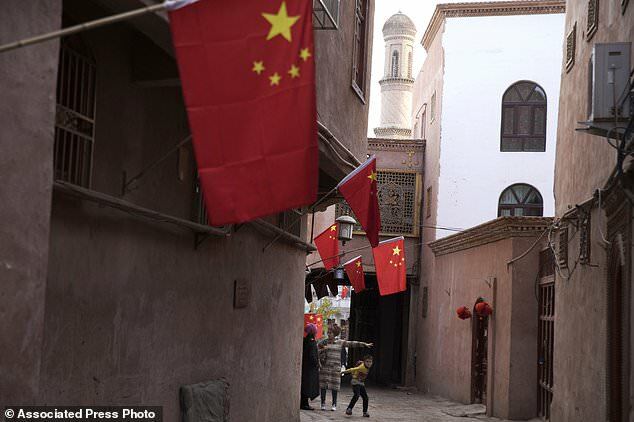 These photos clearly show the aggressive flag policy on the Uyghur land. 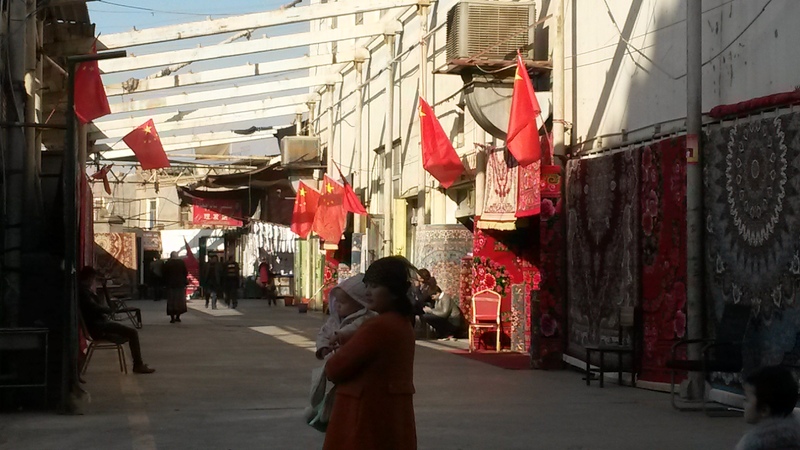 Even narrow streets are full of PRC flags. Most Uyghurs see this flag as their ethnic symbol, but it's almost impossible to get the opinions of Uyghurs living in PRC as it's dangerous for them. I object to the proposed flags on the first message. 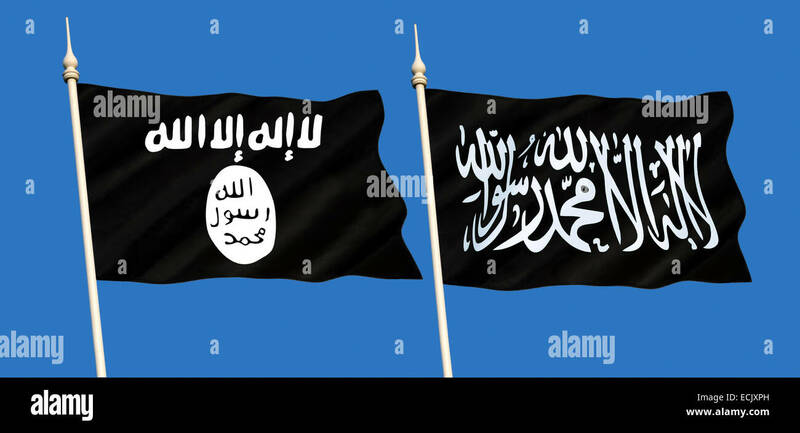 A black-and-white flag with some Arabic script on a plain background looks more like the flags used by extremist/terrorist groups. When it comes to terrorism, this style is the most popular. Those people don't like other colors and symbols much. Also, many neo-nazi symbols and the famous pirate flag is b&w. What I'm trying to say is that using black and white doesn't necessarily guarantee neutrality. If the Uyghur flag is going to be replaced, I suggest preserving the background color (see my first message). Light blue is a common color on Turkic flags (Kazakhstan, Crimean Tatars, Uzbekistan, Azerbaijan etc.). It symbolizes their Turkic identiy which isn't something to be neutralized but a fact. The flag used for Arabic on Tatoeba has a green background, too. Just removing the symbolism should be sufficient. Why censoring the color? Will China sue Tatoeba for picking an 'unacceptable' color? We should at least have that much respect for Uyghurs. Seeing their language with a plain b&w flag among other colorful flags would demotivate most people. On the wall, Porfiriy gave some valuable information about the issue. I want to copy it here, too. This is a sticky situation that has many layers and will most certainly leave no-one satisfied. It is extremely difficult to approach this issue without any bias, and I include myself in that judgement. Just wanted to get that out there. The current flag for the Uyghur language is the flag of the First East Turkestan Republic - more detail here: https://en.wikipedia.org/wiki/First_East_Turkestan_Republic . I personally believe (NB, with my own personal biases in mind) that the original poster's conflation of the use of this flag with the principles of ISIS is wildly exaggerated. The ETR was founded in the wake of the political chaos that ensued when the governor of the region was assassinated and replaced by an incompetent official. It was formed in the wake of a populist rebellion that was highly motivated by the feeling that aggressive Sinicization policies were a threat to local Muslim identity. It is worth noting that the Uyghur flag, currently used by Tatoeba, has been adopted by the completely peaceful, non-terrorist Uyghur diaspora as a symbol of ethnic pride (see https://uyghuramerican.org/sites/default/files/field/image/Uyghur-anti-China-protest-outside-White-House-July-10-2009-Malcolm-Brown.jpg ). Its often seen at protests in the West and in Turkey against the treatment of Uyghurs in Xinjiang, which has been quite bad of late (https://www.nytimes.com/2018/09/08/world/asia/china-uighur-muslim-detention-camp.html ). That being said, the flag is legitimately a cultural, if not political symbol of a large number of Uyghurs in the diaspora. Why the diaspora? The flag is illegal in Xinjiang. If you have one and display it, you will get in trouble, pronto. Basically, the answer to the question "does this flag legimately represent the linguistic community as far as Tatoeba is concerned" can't be answered because most Uyghurs on the planet could not even give a frank answer. Hello! I'm Impersonator, and I'd like to chip in and voice my opinion. From what I've heard about the situation in PRC, Uyghurs from Xinjiang are very unlikely to contribute to Tatoeba anyway. Using Uyghur language is considered unpatriotic, and contacting foreigners lowers Uyghur's social credit and is likely to end them in a 'transformation through education' concentration camp. Uyghur people are required to install spyware called Jingwang that monitors the websites they visit. Contributing to Tatoeba in Uyghur is downright dangerous in Xinjiang, so flag change is very unlikely to affect the contributions in Uyghur from Xinjiang people in any way. Legitimize the PRC's idea that Uyghur symbols are somehow intrinstically linked to terrorism. Increase the likehood of finding Mandarin contributors from PRC. Perhaps decrease the likehood of finding Uyghur contributors from diaspora. I personally hope that the flag will remain. If choosing between Mandarin and Uyghur, I hope Tatoeba will choose Uyghur. Mandarin has quite a lot of proponents without Tatoeba, it has big government backing it up. Not so for Uyghur. If projects like Tatoeba don't choose Uyghur when forced with a dilemma 'Uyghur or Mandarin? ', then who will? My honourable friend, I agree with your suggestion of using tint blue as the background. However, showing that something is banned in a sovereign country doesn't says anything about its legitimacy. And, as there are no laws against the use of this flag in China, I would consider it an 'unpopularity' rather than 'ban'. From the journal I have seen in Chinese, it was only shown in the picture of terrorism happened in Xinjiang, which enforces its association with it. This the a fact, just as people would associate fried chicken with black minorities in the US and prevent using it. In conclusion, your suggestion is appropriate. Notwithstanding our points, we should consider replacing it to weaken this bad association. Uyghur is recognised as an official language for the government as well as education. There are official broadcasting channels that use only Uyghur language, please refer to this. Uyghur is taught to other ethnic groups in Xinjiang as a second language, for example No.1 Senior High School of Ürümqi. I fully consent your feeling. However, whether to change the flag is not a zero-sum game, but a choice for 'the interests of its own expansion', as @sabretou noted. Mandarin, as a language of the most native speaker in the world, is attracting more and more learners. This means speakers of English, Russian as well as many other languages will learn Chinese as their second language, which enables Tatoeba (a powerful tool for language learning and referencing) to gain more influences and more users. Notice that China also has the most speakers of Esperanto – one of the most used language on Tatoeba, which has no government backup – who contribute to Tatoeba everyday. To be honest, I see no profit in favouring any of these languages. Hello! Thank you for your answer. Unfortunately, it doesn't really convince me. The official recognition doesn't tell much. In the Soviet Union, Belarusian was an official language in Belarus, but it was actively discouraged nevertheless. Also, the information from 2010 is outdated. The change of policy is a relatively modern one: replacing Uyghur with Mandarin started in 2017, Uyghur re-education camps were only establised in 2014. The changes rarely happen overnight: the language is not erased immediately. What is important is dynamics: is the language encouraged or discouraged, how the numbers change, etc. The fact that some content is being created in a language doesn't tell much about the place of the language in the public life. For example, North Korea has a website in Japanese, but that doesn't mean Japanese is welcome there. So the fact that there was an interview with Dilraba Dilmurat hardly tells us much. Of course, it's great that interviews like that with Dilraba Dilmurat are being shot. But the question is: how much? How much is being aired in Uyghur as compared to Chinese, how much is being aired now as compared to 2010, etc. Also, the interview with Dilraba Dilmurat seems undated (but my Uyghur is bad — if the date is mentioned, could you please tell at what second? ), but the video mentions the 2013 drama Anarhan (ئانارخان 阿娜尔罕), and the end of the video mentions Swords of Legends (古剑奇谭), a TV series from 2014. So I assume the video is from around 2013 or 2014. The policy to erase Uyghur from the public life is a recent one, so 2014 videos don't offer much information about the current state of things. Again, the question is how many schools are like this. The fact that Uyghur is taught somewhere doesn't give much of a picture: the policy change is a relatively recent, and you can't wipe out the language in a day — it takes some time to do that. What is important is the dynamics, and from what I've read, in most schools it's being removed, and after switch to Mandarin many Uyghur students' grades declined. The fact that a single school might have kept Uyghur doesn't tell much, alas. From the journal I have seen in Chinese, it was only shown in the picture of terrorism happened in Xinjiang, which enforces its association with it. This the a fact, just as people would associate fried chicken with black minorities in the US and prevent using it. I find the comparison with racism curious, and I think we shouldn't cater to people's racist stereotypes (by somehow removing things related to black people). Instead, we should combat racism and harmful stereotypes. I think the same applies to Uyghurs: we shouldn't cater to people's misconceptions about Uyghurs (and Muslims in general). Instead, we should combat these stereotypes, not to play along with them. Dear Chinese-speaking Esperantist friend, I'm relieved to hear that. If that's true, then there's no valid reason or urgent need for change. After all, that's not Algerians' or Turks' decision to make but Uyghurs' whether this flag is unpopular or not, whether it represents them or not. I think we should leave it up to them. I also liked your comparison of changing the Uyghur flag and avoiding fried chicken, but there's one difference. The latter is just a personal choice while the former is not.